Anthony Stoops is Artist/Teacher of Bass and String Area Chair at the University of Oklahoma School of Music. Since winning first prize in the International Society of Bassists international solo competition, he has performed throughout the United States and internationally as a soloist and chamber musician. Dr. Stoops has presented masterclasses in Poland, Brazil and throughout the U.S. at venues such as the Cleveland Institute of Music, the University of Michigan, the University of Iowa, Interlochen Arts Academy, Penn State University, and many others. The past recipient of a Karr Foundation Doublebass, Stoops is widely regarded as one of the top bass soloists in the world today. As an orchestral musician, Stoops has performed regularly in over a dozen orchestras including the Detroit, Columbus (OH) and Toledo Symphony orchestras, and the Michigan Opera Theater among many others, under many of the world’s great conductors such as Sir Georg Solti, Neeme Järvi, Daniel Barenboim, Zubin Mehta, Pierre Boulez and Charles Dutoit. He studied with Diana Gannett at Iowa (and later at Michigan), Stuart Sankey at Michigan, Jeff Bradetich at Northwestern, and Eugene Levinson at Aspen. Other influential teachers include Max Dimoff, Principal Bass of the Cleveland Orchestra, Stephen Molina, Assistant Principal Bass of the Detroit Symphony. In high school, he studie with Dr. Mark Morton, Principal Bass of the Columbus Symphony. As a devotee of new music, Stoops’ wide–ranging repertoire has included premieres of several works, including his own. Prior to his appointment at OU, he taught at Bowling Green State University, the Ann Arbor School for Performing Arts and the renowned Preucil School of Music. He lives in Norman, OK with his wife, cellist Emily Gosma Stoops and their son, Henry. In his spare time, Anthony enjoys fishing, cooking, swimming and Yoga. He maintains a website at www.anthonystoops.com. 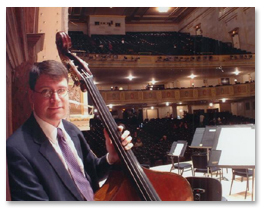 Check out an excellent interview with Anthony Stoops from Contrabass Conversations. Below you will find the complete list of scores composed and edited by Anthony Stoops.